On 21 December 2013, I first became aware of an image of a thrush portrayed on the above Stonehenge incised chalk plaque. That moment proved to be the inspiration for this blog. This fascinating object was discovered between King Barrow Wood and Stonehenge Bottom in the late 1960s by Major HM and Mrs. F De M Vatcher. It was found along with a second slightly smaller plaque during the widening and lowering of the A303 road near Stonehenge in the chalk of the verge on the north side of the carriageway, 211 yards west of the wood. The plaque above is approximately three inches square and seven sixteenths of an inch thick. It was found near the base of the pit at a depth of a little under two feet from the surface. The upper part of the ditch filling was empty of finds and compacted, consisting of red-brown soil and fine chalk nodules. An antler pick sat on top of the lower layer near a small scapula, thought to be that of a sheep. Sherds of grooved ware and various animal bones were found throughout the lower layer. A number of small grooved chalk lumps were also found. It was concluded that the upper layer of the pit was filled soon after the placing of the goods in the lower layer, as the sides were not weathered. At the time of discovery broad comparisons were made to Iberian clay and schist plaques, although no similarity of design or purpose were identified. Holes were bored in the corners of many of the Iberian examples, which is not evidenced on the plaque portrayed above or the second plaque found (Antiquity 43 1969 310-11). The pit in which these plaques were discovered subsequently became known as the ‘plaque pit ‘. Two radiocarbon dates place the material in the early third millennium BC, amongst the earliest dates for grooved ware in Southern England. These two plaques now form part of the permanent exhibition at the Stonehenge visitor centre, opened in December 2013, and are dated by English Heritage at between 2900 BC and 2580 BC. During the monitoring of a cable trench across King Barrow Ridge by the Southern Electricity board in 1968, Major and Mrs. HL Vatcher for the Ministry of Public Buildings and Works excavated two apparently isolated post holes just to the northeast of the plaque pit. The easternmost post hole was recorded as 3 feet 6 inches wide with a maximum depth of 2 feet 8 inches. The excavation plans and sections describe potboilers, charcoal, decayed wood, pottery and bone as present. The bone is described as bone on base ox fragments. Unfortunately, the only finds surviving with the excavation archive are three sherds of grooved ware. The second post hole lay approximately 32 yards west of the above, and approximately 94 yards east of the centre of barrow Amesbury G39. Pottery was noted from the edge of the feature and sherds of a single vessel survive, representing a small bowl or cup dated to early to middle Neolithic date. Comparisons were made by Cleal and Allen in 1994 of these post hole pottery styles to discoveries at Windmill Hill, 18.63 miles north, and to assemblages from Fussells Lodge Long Barrow, less than 6.2 miles to the southeast. Comparison was also made between heavy rim bowl fragments found in barrow Amesbury G39 (west of the plaque pit) when excavated in 1960 by Paul Ashbee, as exhibiting characteristic features of the Windmill Hill or decorated style of central Southern England. Looking at a plan and section of the chalk plaque pit, three sherds of grooved ware were found near each of the plaques. Two to the west, one to the south of the larger plaque, and three to the southwest of the smaller plaque. Sherds of grooved ware have been found at other locations in the immediate vicinity of the plaque pit at King Barrow Ridge and Coneybury Henge. A fragment of a tiny grooved ware pot was found in Aubrey Hole 29 close to the southwestern end of Stonehenge’s axis by Colonel Hawley while excavating the site in the 1920s. Whilst he was excavating the ditch alongside the south causeway, he unearthed six sherds, two of which joined together, making a typical grooved ware motif of a rough chevron pattern, together with a single ‘Windmill Hill’ style sherd found near the Heelstone. I am not aware of any subsequent grooved ware finds on the actual site of the Stonehenge monument. The Stonehenge incised chalk plaques have been under discussion at Eternal Idol and the two specific threads are linked here and here. 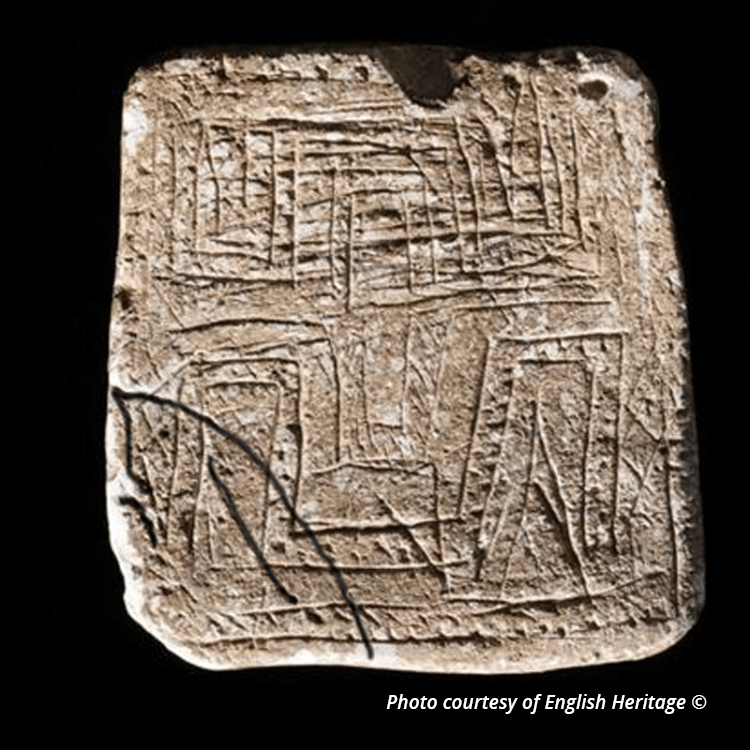 In John North’s 1996 book Stonehenge Neolithic Man and The Cosmos, he described the incised chalk plaque shown above as ‘Looking like nothing so much as the plan of a complex building. I am currently working with an artist to produce an impression of one of these possible buildings and hope to post the results here. North of the plaque pit is the Stonehenge Cursus, a huge rectangular earthwork enclosure defined by a chalk rubble bank and external ditch 1.7 miles long and described by English Heritage as being constructed in approximately 3500BC. The location of the Cursus is thought to have influenced the later location of Stonehenge. On 6 August 1723, William Stukeley, who first discovered the Cursus earthwork, noted that two entrances were still visible at that time. The northern entrance was identified by Mr. A. Burl in his 1987 book The Stonehenge People at a a grid point of SU131432. Mrs. Faith Vatcher confirmed the grid point of the plaque pit at SU131420. The plaques therefore appear by sheer coincidence to have been positioned by our ancestors directly south of the original entrance to the Cursus. I hope to return to consider this apparently random concurrence at a later time. It is claimed that immediately before sunrise on the longest day, a bird perches on the Gnomon Stone at Stonehenge and flies away as soon as it has seen the sunrise. Throughout the rest of the year no bird ever alights on that stone . I would like to express my heartfelt gratitude to those people who have been instrumental in facilitating and inspiring the launch of Silent Earth: Patricia Kinsley, Paul Kinsley, Sophie Kinsley, Alan Sanford, Dennis Price, Susan Grearney, Geoff Carter, Mrs. Cornelius Reid, David Cornelius Reid, David Jacques, and our inscrutable ancestors, whose land we share, and in whose footprints we tread today . The first fine careless rapture ! Dedicated to the memory of Myfanwy Faris , a lady who weathered the storms of life with unyielding grace .